From the Baldwin County Courthouse, go west on Hancock St. which becomes Highway 49 and follow Highway 49 south for approximately 10 miles from the Courthouse. Turn left from Highway 49 onto County Line Church Road. 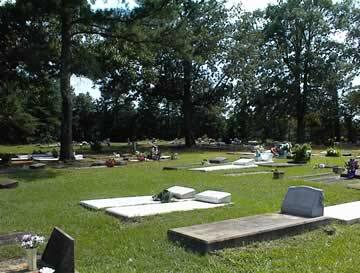 The cemetery is on the corner of Highway 49 and County Line Church Road. Graves numbered 500 and above are off to one side of the church. Indexed by Larry and Eileen Babb McAdams, 2002. PH (Purple Heart) & GS. "Beloved son, brother, husband, father"
"Dea." "In memory of" "Beloved husband of Addie Pearl Butts". "In memory of" "Brother James Curry"
"We will meet again" On same gravestone as Daisy H. Easley. "We will meet again" On same gravestone as Thomas Easley. Pvt 279 Infantry, 45 Inf. Div. "Love, wife, children and grands"
Name unreadable. Unsure if name is Limmer M. W. or M. W. Limmer. Georgia Pvt 1 Co 2 Development Bn. Last two digits of death year unreadable. Georgia PFC Co K 179 Inf Regt. Georgia Pvt 567 Serv. Bn. New grave as of 2002. Death year ends in 5. Decade unreadable. Georgia Pvt 4 Co 2 Development Bn.